WINGNUT/ECOPIONEER debuts its solar powered bicycle trailer at Sea Otter Classic in #364. 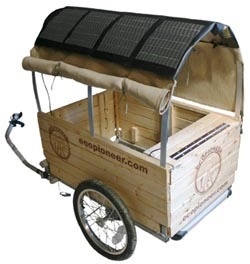 The ECOPIONEER tour of renewable energy education, demonstration, and promotion will have a custom built solar powered Charriot cargo trailer pulled by Calfees new bamboo MTB bike frame. It will be making the rounds at Sea Otter handing out educational literature, Chamois Butter and a quick charge to anyone with a DC or wall socket plug for their cell phone. Back at the tent the solar and wind power systems will be running a test to heat the Gen 2 tent, and power electronics from TOSHIBA'S new tablet laptops to video cameras and communication radios. NEW SUN PRODUCTIONS, which distributes the WINGNUT pack line as well as the solar panels used to power the tents, has developed ECOPIONEER to help present sustainable business practices and renewable energy with a hands-on experience. "The tent and power systems are completely outrageous," admits Scott Gibson designer at NEW SUN. "But it's all real. I am collecting what I can and assembling and testing it for the future, it's something the industry can use and people will be able to relate to." For the cycling industry to relate to, ECOPIONEER has the LEV (Light Electric Vehicle) testing program to take place this summer. GLOBAL SOLAR , the solar sponsor, just pulled 4 panels from their production line for rewiring to match up with the higher voltage batteries of electric powered bicycles. ECOPIONEER is looking for sponsors within bike industry who think they are ECOPIONEERS and want to be part of the ground-breaking LEV testing program. If your company is interested please contact Jeff Stoner at FDTmarketing.com, (858) 775-7104 or go to booth #364 at Sea Otter and ask for Scott (he's the WINGNUT in the kilt). Check up on the tour at wingnutgear.com. Coming soon.... THE ALPHA TENT.